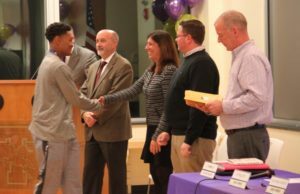 The Troy High Football team was honored this week at the Board of Education Meeting. Guest speakers included Mayor Patrick Madden and City Council President Carmella Mantello. Coach Bob Burns was honored as New York State Best Coach. Troy High won the state championships last month, finishing their perfect 13-0 season. Each player and coach received certificates. The players also wore a championship shirt and medal. Mayor Madden spoke to players directly and congratulated them on their tremendous success. “Over the years, you may well lose touch with each other,” Madden said. “You will be connected through this year’s experience. You will come back and run into each other 25 years from now and that bond will still be there. That’s something few of us experience in this world.”.